Are you curious and want to learn more about Electric Bikes? Electric bikes make all sorts of things possible. Hills disappear. Miles disappear. Grown-up behaviour disappears! Fun and long rides with friends and a permanent tail wind are now yours for the taking. At some sessions we have a guest speaker, someone local who has been riding their electric bike for some time, to give you their perspective on riding electric bikes in Hawke's Bay. This will also be a good opportunity to meet other people to go riding with. 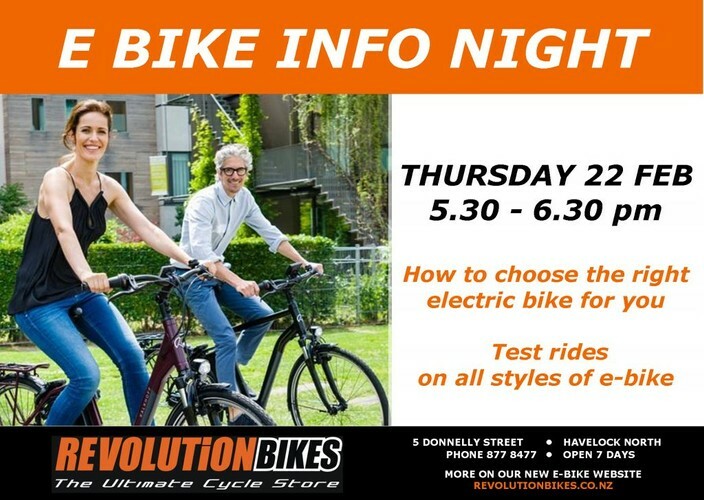 So please join Hilton and the team at Revolution Bikes for the next electric bike info session.